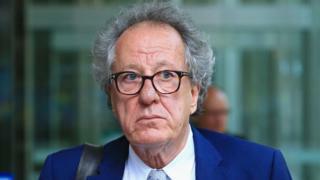 Australian actor Geoffrey Rush has won a defamation case against the publisher of a Sydney newspaper which accused him of inappropriate behaviour towards a former co-star. Judge Michael Wigney said he was "not satisfied" that the incidents detailed in The Daily Telegraph, published by Nationwide News, had occurred. He said Mr Rush's former co-star Eryn Norvill's evidence was "inconsistent". He also said she was "prone to exaggeration and embellishment". Judge Wigney ruled that Mr Rush, 67, should be awarded A$850,000 (￡464,420; $608,680) and would be entitled to more compensation, the exact amount of which would be decided at a later date. He was originally seeking more than A$25m in damages, reported the Australian Broadcasting Corporation. Mr Rush had previously said that his career had been "irreparably damaged" by the newspaper's reports. The alleged incidents detailed in The Daily Telegraph article date back to a 2015 theatre production of King Lear in which Mr Rush acted alongside Ms Norvill.